Steven (Chicagoland, United States) on 16 September 2014 in Architecture and Portfolio. The Peter A. Beachy Residence is a home in Oak Park, Illinois that was entirely remodeled by architect Frank Lloyd Wright in 1906. The residence that stands today is almost entirely different from the site's original home, a Gothic cottage. 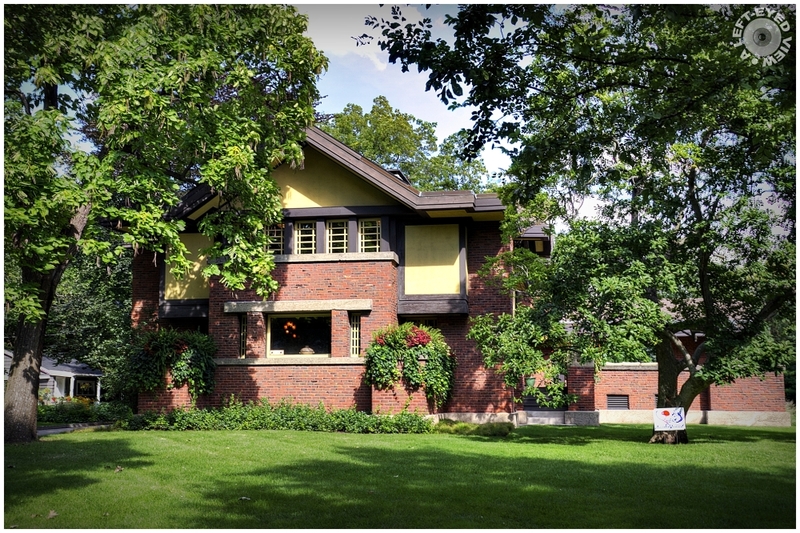 The residence is listed as a contributing property to the Frank Lloyd Wright Prairie School of Architecture Historic District, which was listed on the U.S. National Register of Historic Places. The original residence, a Gothic cottage, was almost entirely replaced when banker Peter A. Beachy commissioned Frank Lloyd Wright to "remodel" the home. The residence is set at right angles to the street to utilize part of the cottage's original foundation and take full advantage of a southern exposure. Wright built this residence after returning from a trip to Japan, and the exterior has several Japan-inspired elements. Though the Beachy Residence incorporates an earlier structure, the original building is completely obliterated on the interior. The only evidence that the original house, known as the Fargo House, still exist are found in the basement of the Beachy Residence. The house has seven gables and sits on the largest residential lot in Oak Park. Much of the furniture in the house was also Wright-designed but the windows contained only wooden muntins, no leaded or colored glass. However, Wright designed leaded-glass light fixtures which are used throughout the house. Superb photos and stunning architecture in this series - bravo! Superbe maison installée dans un écrin de verdure et de lumière. Superb house set in lush greenery and light. Excellent image as always. Thanks for the information too. such beautiful frame, colors, lighting & shadows! A gorgeous house! I love the porch. I would love to see the inside of the house! That is a very cool shot. I wish we had architecture like that around here. Another lovely house! Hard to imagine it's a remodel. I enjoy the beautiful photos throughout this series. magnifique et remplie de lumière. The elegant house is nicely captured in the beautiful light. A fine picture of this stately home. It looks so substantial and well put together. No longer a 'Gothic Cottage' ... interesting that this one sits on the largest lot in the area.